Derrybawn Mountain is the 647th highest place in Ireland. 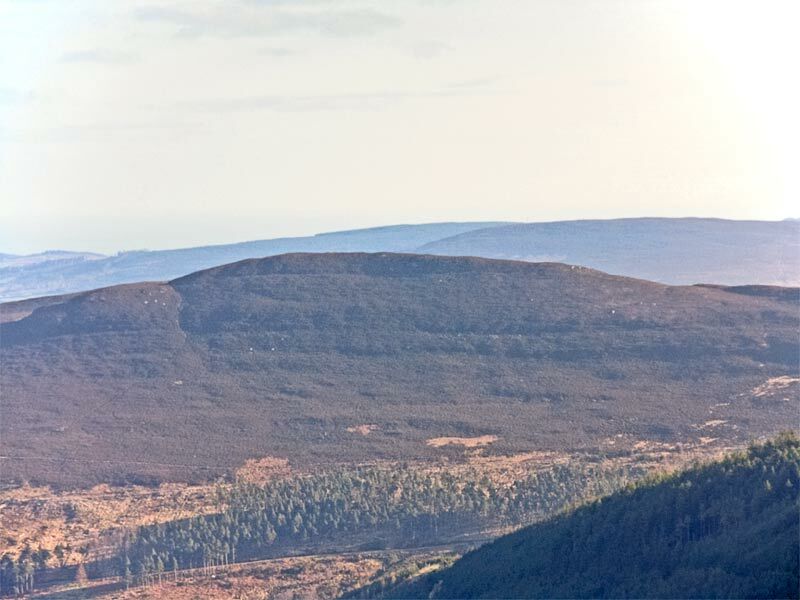 Picture from group : Derrybawn from west with ridge extending to the right. Picture: Derrybawn from west with ridge extending to the right. Airy ridge at a meeting of valleys. 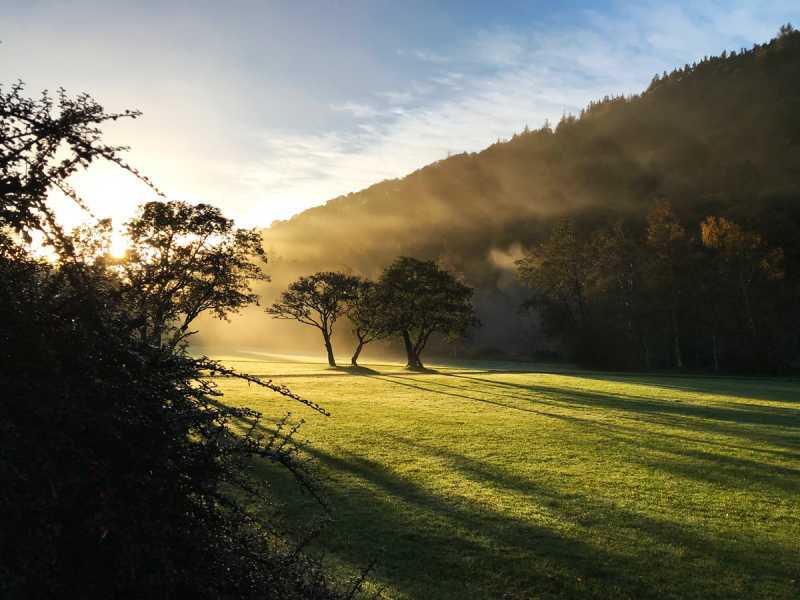 Derrybawn has a great situation, looking into four glacial valleys and above the well known Glendalough lakes. The summit is the north end of a 1.6km ridge, the best formed in Wicklow. Many of its lower slopes are planted with mature oak trees. Picture from simon3 : Helicopter over Derrybawn. Derrybawn is famous for its 1.5k ridge stretching SW from the summit. Of course there's many more spectacular ridges elsewhere in Ireland such as the Beenkeragh off Carrauntoohil, the Corranabinnia ridge, the Turks, Slieve League, Bhinn Láir and the Teeromoyle Tooth. But if you live around Dublin, the Derrybawn ridge and the Faninierin ridge are really all there is - The Derrybawn ridge being much easier to incorporate into a looped walk. Sadly the ridge has suffered over the years from trail erosion. There is now a path along its length which has formed entirely in the last 30 years. 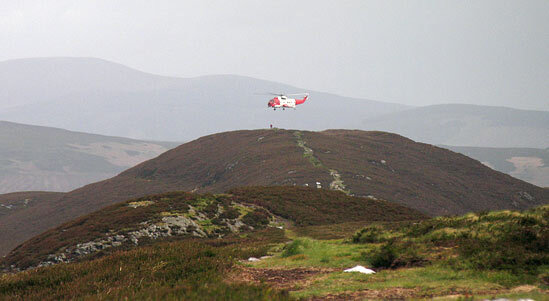 Taken from along the ridge, the picture shows what looks like a mountain rescue drill, with the helicopter hovering over the summit. Picture from simon3 : View from Derrybawn to the West. Picture: View from Derrybawn to the West. Derrybawn is the oak-footed southern mouth of the Vale of Glendalough. Steep on its north side, its easily reached from the carpark at the Glendalough Visitor Centre or the car park between the two lakes. I spent around two years in the 70's mapping it for Orienteering purposes - I know Derrybawn in all its seasons and learnt a bit of its history from the former owner of Derrybawn House.